Traveling can be a hefty expense. There comes a time when you will require suitable accommodation at a bed and breakfast or lodge, but that is not without its own set of problems. Reserving a room, finding a hotel that fits your budget and finally checking in should be easy and without fuss. 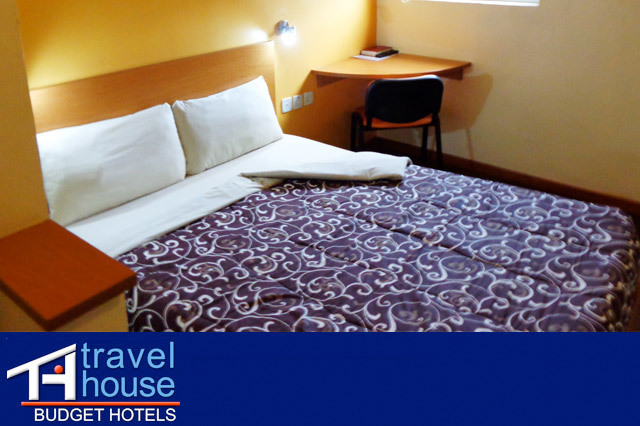 Travel House Budget Hotels serve as a home away from home, offering a quality service by providing basic accommodation at an affordable price. Find comfort in our budget hotels in Ibadan and Lekki. Our professional and friendly staff will ensure that you feel at home. 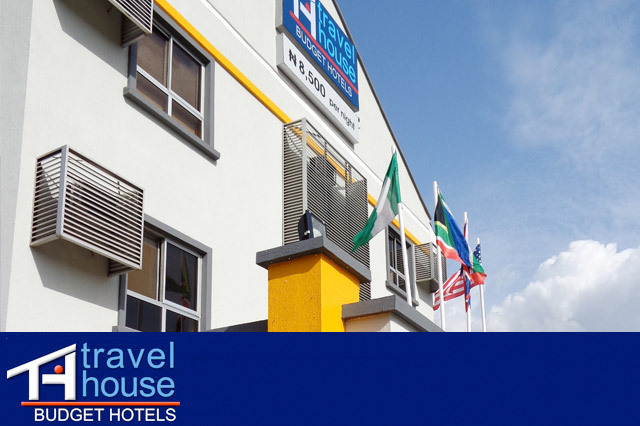 Travel House Budget Hotels in Ibadan and Lekki offer accommodation and conference facilities for business. At both Travel House Ibadan and Travel House Lekki you can settle into a fully air-conditioned en suite room with free WiFi, a double bed, a TV (minimum three satellite channels), a writing desk and chair, a telephone connection to reception and a bathroom, with shower and toilet unit. 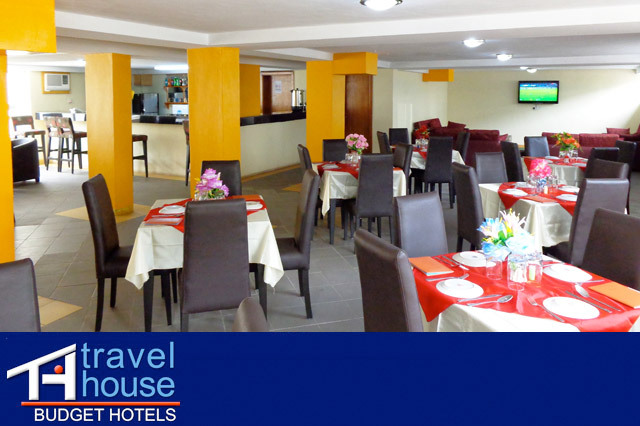 Travel House Ibadan has its own restaurant and bar, a restaurant menu can be found in your room. Enjoy a complimentary cup of coffee or tea in the morning or a glass of cold water. At Travel House we believe in safety first. Our hotels have 24 hour security on patrol, as well as an overnight mobile police force. 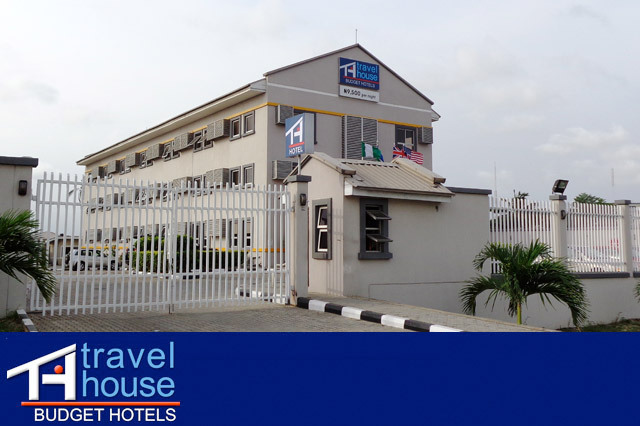 Both Travel House Ibadan and Travel House Lekki are conveniently located near additional food and beverage establishments, laundry services and taxis services. 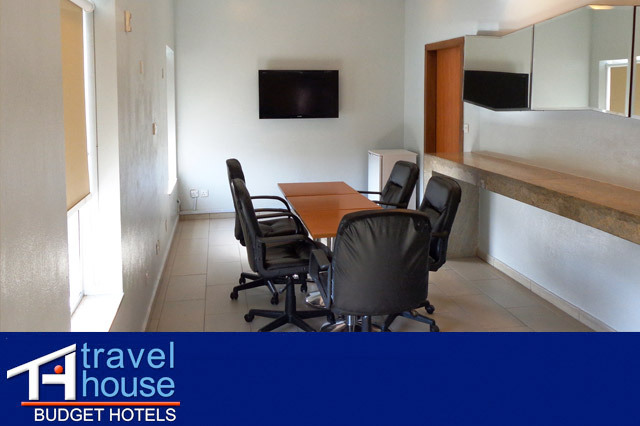 While Travel House Budget Hotels offers affordable accommodation for leisure, we have a 20-seater conference room available to meet your business needs, whether you require a room for a seminar, as a training facility or for meetings, it is available at an additional cost. Book today to make use of our quick and easy check in service. Find detailed hotel reviews at Tripadvisor or keep an eye on our social media platforms, Facebook and Twitter. A place where you never miss the best Hotels. It is not common to find a place where you get all the services available in one place. But at Ibadan, we have the best hotels that offers the best accommodation in the best hotels .The hotel rooms have the best features than you could ever imagine, it well service with air conditioner installed in them to make sure that the atmosphere of the room is perfect. There is a TV set that connects to minimum channels of three and to complement that is the free wireless internet. The room is also fitted with a double bed, a writing desk and a desk chair which is meant for those guests who would want to read or write. Besides, the presence of a telephone connected to the reception desk will help you in those reading and writing tasks while still in your room and this is not all because right inside your room is a toilet and a shower unit that is very modern and will give you the maximum comfort that you require while in your room. With the help of a restaurant menu, you can order anything that you need to be availed to your room. For enough security, we have put in place a 24 hour security police and an overnight vigilance, and also 24 hour power generation is in order. Each morning, we have tea and coffee plus cold drinking water. And for other safety purposes, we have an express check in and check out. Treatment of water is also available in place for safe drinking water. Other additional facilities include laundry services to clean your cloths and optional food and beverage shops within the vicinity. If you have some scheduled meetings, then conference rooms for twenty at a cost. There is where you will find the best accommodation in the best hotel rooms in this country. The hotels here are well furnished and have all that a modern tourist or any guest could ever request. All the services here are perfect through the presence of the comfort budget hotels. All that you need in your room is endless comfort and for that matter, the hotel rooms are well set with the presence of free Wireless WIFI internet that helps you to connect to the virtual world. There is an air conditioner to that makes sure that the room adjusts to an optimum condition good for the guest. With a double bed, a desk chair and a writing desk, you can be able to work from the room and deal with your paper or office work. For maximum comfort, we have a double bed in place for you to enjoy the rest of the night and a telephone connection to the reception desk and for that, you can order for any service at any time. Within your room are the best and most modern toilet and shower units with ample supply of water and all the toiletries that you may require. The crown it all up, is restaurant menu that assists you when ordering what you need. There are other additional services that are crucial: we have for you the complementary morning tea and coffee and apart from that we ensure your security for up to 24 hours for all the days and also we value the use of check out and check in. We also treat water through our water treatment plant. For other extra services nearby, there is laundry, Taxi and foods and beverage joint and for meetings, we have conference room for twenty people at a cost though. Are you aware that Lekki is the best place in Nigeria where you can get the best comfort and budget hotels? If you didn’t know this then this is the time that you must know. This is the biggest tourist destination and guests have been considered through the presence of the best hotel rooms. These hotels offer the best accommodation services than any other hotels or travel hotels. The rooms have the best appearance with spacious double bed that is even enough for two people like couple and at a far corner, is a TV set that can be tuned to more than the three basic channels through the satellite. In case of those visitors or customers who would want to browse, then we have a free WIFI internet that is fast in connection. The hotel room is also conditioned with the presence of air conditioners and beside this is a desk chair and a writing table for your paper and reading work and in addition there is a shower unit and a toilet unit within the room and you don’t need to go far from your room for showers or anything else and with the help of a restaurant menu, you are free to order for any service. We have put in place 24 hour power generation and a mobile police and an express check in and check out. There is also a complementary tea and coffee for your mornings according to your preference and for safe drinking water we have established a water treatment plant near the hotel to supply clean treated water. Conference rooms are also available for twenty people sitting but for an extra cost. Laundry services together with food and beverage joints are also not far from the hotel and you can opt for that. This is not the first time that that we are offering the best services for our customers. At Lekki town we have the best rooms that will suit the needs of our guests and these includes the best rooms in comfort budget hotels that we use to give the best accommodation in Nigeria and if this is the case then here is what we are offering: We have the best rooms which are air conditioned to keep the air inside the room suitable for the inhabitant and in addition we also have installed a free WIFI internet that enables the owner of the room to connect to the internet plus a TV set that tunes upto more than three channels. We also have in it a double bed that is very spacious, a writing desk and a desk chair for your office work. Moreover, there is a telephone connection that can be used to reach the receptionist, a shower unit and a toilet is well supplied with water both cold and hot respectively for you to shower and get the maximum comfort in the room. There is a restaurant menu also that helps you to order whatever you need. Other complementary services includes tea, and coffee for the morning, cold drinking water and security that is kept for 24hours through the presence of a mobile police and ample power generation plus the availability of express check in and check out. Within the hotels is a water treatment plant for safe water. Other additional services found around the vicinity of the hotel includes conference rooms for twenty people at and extra cost in case of meetings by our guests and for more food and drinks, there is a place near the hotel where you can find that and also taxi and laundry services. Have you ever thought of where to get the best hotel services in Africa? If yes, then we have an answer here for you. The best hotels that are very economical and affordable are found in Nigeria, The western coast of Africa. Hotels in Nigeria are the best in terms of services offered and the general conditions are very good. The hotel rooms are self sufficient with air conditioners that make the atmosphere within the room very friendly. There is a double king size bed and in front of it is a TV set with multi cannels and you can switch from one channel to another and to make things complete for you, we have put in place a free WIFI internet that allows you to browse as fast as possible and connect to the internet. In addition to all this is a shower and toilet unit within the room and you can shower at any given time due to ample water supply. Apart from that the room has writing desk and a chair where you can rest and do some paper work during your stay and there is also a telephone with a line directly connected to the reception desk in case you need any clarification or order. If you fill like eating then you just consult the restaurant menu and ask for food. To complement all the rest, we offer tea and coffee in the morning hours and for the general security we have a mobile police that is stationed all the time plus a 24 hour power generation that ensures constant supply of energy for you and for the systems in your room. Water treatment plant is also available and if you need services from laundry or beverages and food and even conference room for twenty people, then they are available at a cost. With an African modern culture in Nigeria, there has been an establishment of the most modern hotels with the best facilities and services offered. You are entitled to get more comfort here than any other place ever. This is the comfort budget rooms in our hotels and they come with the best accommodation in Nigeria. We offer you rooms which are air conditioned and are complete with a double bed, a writing desk and a desk chair for you just in case you will be in need of a platform to do your diplomatic and office work. The rooms are also connected to a WIFI free internet and a Television set that connect to a minimum of three channels and this will ensure that you get the maximum entertainment and a lively stay. Your room i.e. if you are our quest has the most beautiful shower and toilet units and a full supply of water all day long for twenty four hours in seven days and so you don’t have to fear for water shortages. This is the best offers in the Nigeria hotel room. For the case of those people who like ordering while in the room, a restaurant menu is there for the order to be made. It does not stop at that point but there are more; we have a 24 hour security police and power generators together with the express systems of check in and check out. This is just to make sure that our customers are safe all the time. During morning hours, avail tea and coffee plus drinking water that have been treated from within by our water treatment plant. Other facilities that you may need are laundry services, food and beverages and all this are her but as for the conference room, and you will hire it at a cost. It is yet another season that we come up with the best hotels with cheap prices for a length of stay for our customers. This is a move that gives our guests the best hotel services in our chain of hotels. As you will find out, you will get to know the truth of this idea. The rooms that are kept aside for you are fitted with air conditioners, and a TV set that allows you to watch more than three channels through satellite signals and to ensure completeness of your room, we have for you a free wireless WIFI internet network that connects you to the world. It is not enough that way, again, our en-suit rooms have a double bed the is large enough and within the same room is a well furnish writing desk and desk chair in case you need to do some reading to make your day real. Besides your bed is a telephone connection to the reception and in your own time at any time you can call and stage your complain or a request. The shower units are also modern and available just within the hotel room. Other complementary services include morning tea and coffee and coming with it is safe drinking water that will make your morning great. As for the security, we have a 24/7 mobile police together with ample power generation to light up the nights and supply you with any required energy. An express check in/out is also there to keep away intruders. The water treatment plant is also situated near the hotel to ensure clean drinking water. There are nearby food and beverage joints that you can have an option on them. Those visitors who come in large numbers for mission or meetings can hire a conference room for twenty people at an extra cost. Experience the best and cheap Hotels in Nigeria. There are so many guest hotels in this country called Nigeria but not all of them are the best and cheap. And for that matter, be assured that we have the quality and the cheapest services here just for you. The hotel rooms are very nice looking with shower and toilet units that are modern and good looking and besides being cheap, they have air conditioners and TV sets that makes you comfortable all day long and all the nights. We believe that these are budget friendly and economical for those guests who are cautious about the prices due to their level of income. Apart from that, the beds are double and besides it, are a writing desk and a desk chair that holds a telephone. The telephone is connected to the receptionist desk and with help of a restaurant menu you can order for anything through the receptionist. To add on the above services, there are more services available. We offer a 24 hour security through an overnight mobile police and a constant power generation. Breakfast is also available with complementary tea or coffee and cold drinking water that is well treated from a water treatment plant within the hotel. To ensure that we track the entry and exit of our guests or customers, we have come up with an express check in and checkout system that helps us keep at bay dangers that might come to our visitors. Our hotel might be cheap, yes, but the services that we offer are exceptional. Imagine that you can come in groups and hold meetings that may last for days using our conference rooms with a capacity that holds 20 people. Taxi services, food and beverage and laundry shops are also found in within the hotel. You have been too many hotels but you are not guaranteed to wonderful services but as for our hotels we have the best for you because you are our number one priority. Our chain of hotels includes the Nigerian hotels that have the best rooms that are also self contained and they give our customers the maximum comfort. During your stay at our hotels you will be living in a room that is contained with double bed that is large enough to hold couple and also there is a telephone the is directed to the receptionist and with the restaurant menu, you can call and order for anything or any service that you fill like having it. For your reading and writing, the room has a desk and a desk chair that will allow you to sit and read or even write. This is the facilities that we have ready for your stay in or hotel. Other complementary services are morning tea or coffee that will make you fill great and ready for the day ahead. Warm and cold drinking water are also available for our guests. On the other hand security to our hotels is upheld and twenty four hour security and this includes a full time overnight mobile police and the power generation capacity. This ensures that the hotel and its compound are secure enough for our guests. There is also a water treatment plant within the hotel that is build to freshen water and ensure that water is for use. We also have food and beverages that are available near the hotels and there are also laundry services and taxi services that can take you to wherever you want. And for those people who would wish to hold meetings, conference rooms for twenty people are available.